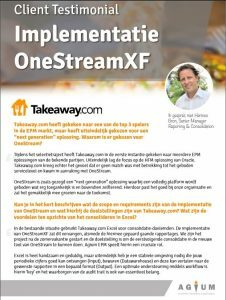 Takeaway.com enhanced its Close and Consolidation proces by going from Excel to OneStream XF. Takeaway.com is a leading online food delivery marketplace, focused on connecting consumers and restaurants through its platform in 9 European countries and Vietnam. Takeaway.com offers an online marketplace where supply and demand for food delivery and ordering meet. 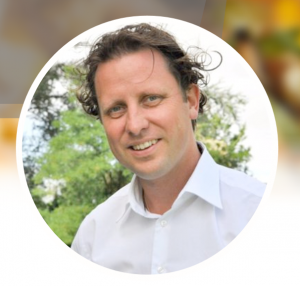 The company commenced operations in 2000 when its CEO, Mr. Jitse Groen, founded and launched one of the world’s first online food delivery marketplaces, Thuisbezorgd.nl, in the Netherlands. 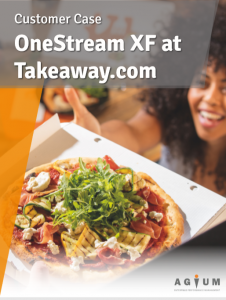 They work with participating restaurants that deliver food themselves, with the Takeaway.com platform serving as a source of orders for them and facilitating the online payment process. The marketplace is available for consumers through mobile applications and via our website. Takeaway.com derives its revenues principally from commissions on the food ordered through its platform and, to a lesser extent, from online payment services fees.
" With the help of Agium EPM we were constantly able to execute the right activitites at the right time making sure deadlines were met." Want to go from outdated tools to modern EPM?